Karnes County (754 sq miles) neighbors DeWitt County and produces gas from the Edwards Reef Trend in South Texas. The region is not new to the oil & gas industry, but the Eagle Ford drilling boom brought development levels not seen before. The county is prospective for shale oil, shale gas, and the gas - condensate or liquids-rich window of the Eagle Ford Shale formation. Karnes County forms part of a prolific area of the Eagle Ford where wells produce greater amounts of condensate, oil, and wet gas. The dry gas window of the Eagle Ford also passes through the county along the Southeastern border and into Bee and Goliad counties. 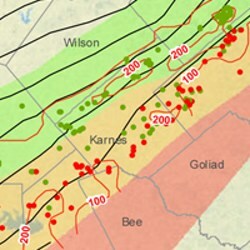 Karnes County drilling is focused in the central portion of the county that is prospective for wet gas and condensate and the northwest third of the the county that is prospective for oil . The best shale oil wells have come online producing more than 1,000 bbls/d. The county is approximately 50 miles southeast of San Antonio, TX. Karnes City serves as the county seat. Notable communities include Cestohowa, Ecleto, Falls City, Gillett, Helena, Hobson, Kenedy, Panna Maria, Runge, and Wintergreen. County services of interest to oil and gas lease owners include the Karnes County Appraisal District (tax collector) and the Karnes County Clerk (property records) office. Join the Karnes County Discussion Group today - your voice counts! Burlington (ConocoPhillips), EOG Resources, Murphy Oil, and Plains Exploration all have significant acreage positions in Karnes County. EOG Resources targets the shale oil window of the play and has drilled shale wells in the northern portion of the county. Notable initial production rates include the Wiatrek Unit with two wells averaging 857 bopd and 682 mcfd, the Vickers #2H 743 bopd and 444 mcfd, Wagener Unit with four wells averaging 563 bopd and 478 mcfd, the Dullnig #5H with 1,353 bopd and 1,224 mcfd, the Braune Unit #3H with 601 bopd and 458 mcfd, and the Greenlow Unit with two wells producing an average of 607 bopd and 386 mcfd. Murphy Oil also targets the oil window or more liquids prone area of Karnes County. The company expects wells will ultimately recover as much as 400,000 boe. Plains Exploration targets the Eagle Ford Shale gas formation at depths of 9,500 ft to 11,500 ft on its almost 60,000 acres in the central portion of the county. Wells produce condensate and liquids-rich gas on Plain's acreage.